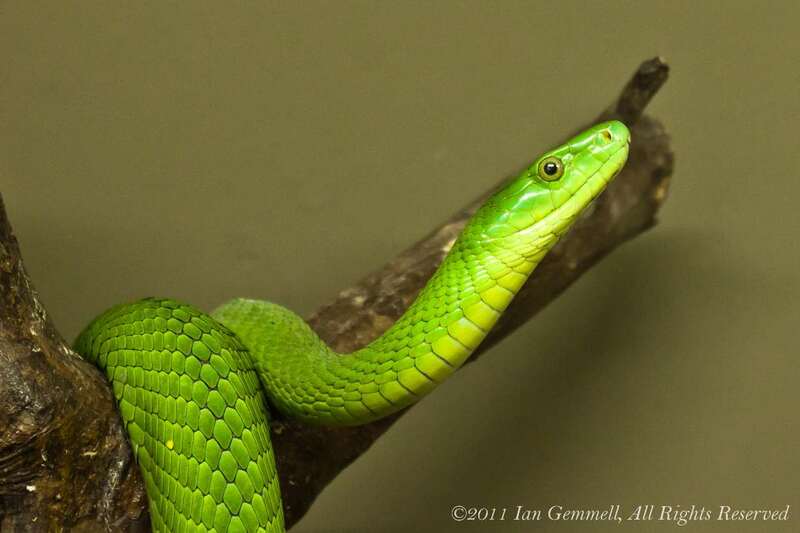 The eastern green mamba or common mamba (Dendroaspis angusticeps) is a venomous arboreal snake indigenous to the eastern side of southern Africa. Eastern green mambas are the smallest members of the mamba genus, averaging 1.8 metres (5.9 feet), with known specimens to 3.7 m (12 feet). The species is found in forests chiefly near the coast stretching from the Eastern Cape in South Africa through Mozambique and Tanzania as far as south-east Kenya, going inland as far as southern Malawi and eastern Zimbabwe. This photograph was taken of a captured specimen at the Riverbend Crocodile Farm near Southbroom on the South Coast of KwaZulu Natal, South Africa.